A HUB set on its trial run. The HUB set samples that arrived from China are being put through their paces in the adjoining photo. 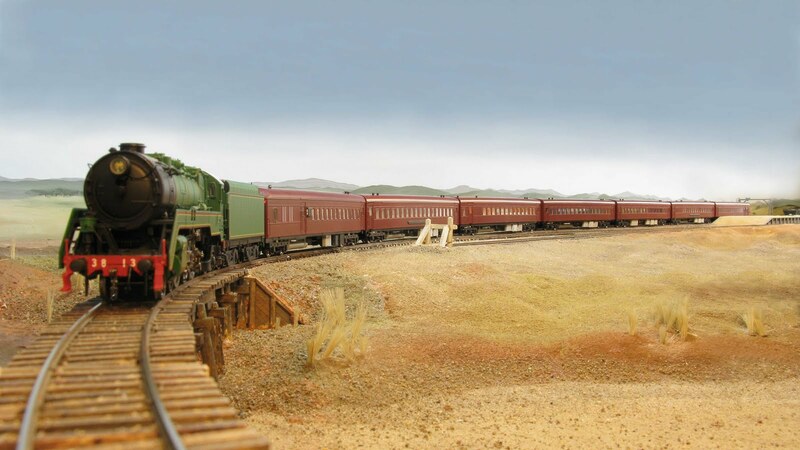 With the new bogie design method the sets are very free rolling and the set was lifted up the ruling grade on Werris Creek without problem. The samples have now gone for painting. They will be available for viewing at the Liverpool exhibition either on the Eureka stand or on one of the exhibition layouts where it is anticipated that one set will be running all weekend. Four sets of HUB set samples including one complete running set have arrived from the factory. The samples are being photographed and then will go through a checking process before being painted. Art-work is currently being prepared to go upto the factory. This art-work will be reproduced in the next edition of The Eureka Times along with advice on set numbers etc. 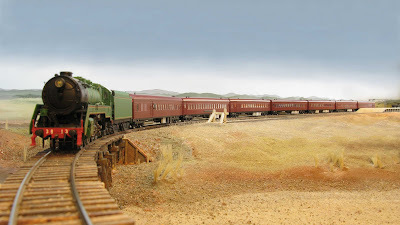 The carriages include a new bogie design which provides superb running qualities. When photographs are available they will be posted here.